Food aspiration happens when food accidentally goes down the wrong pipe, getting into the airways instead of the digestive tube. Normally, the epiglottis, a flap of tissue, covers the airways to prevent food from going down the wrong pipe and only opens to allow breathing. When you eat too fast, try to talk while eating, move around a lot or have medical conditions that affect nerves and muscles, causing reduced swallowing and coughing reflexes, food aspiration may occur. The main risk with aspirating food into the lungs is suffocation, but other complications such as pneumonia may also occur. Symptoms are usually immediate and involve coughing, difficulty breathing and panic. Food aspiration should be treated as a medical emergency. What is aspiration? The term refers to pulmonary aspiration, which is when either food particles or fluids or mucus and saliva are aspirated into the lungs by accident. Food aspiration is not the same thing as suffocation, although it can progress to it if the chunk of food in the airways is big enough to obstruct breathing completely and cannot be dislodged in time. Food aspiration in babies, children, the elderly and individuals with medical conditions that predispose to swallowing difficulties, nerve or muscle damage account for most cases. How does food aspiration occur? The pharynx is the part of the throat that separates into the esophagus (food pipe) and airways consisting of the larynx (voice box) followed by the trachea (windpipe). The larynx is covered by a tissue flap called the epiglottis which covers the airways when we swallow food and water to prevent them from going down the wrong pipe. When food aspiration occurs, instead of passing into the esophagus and then the stomach, food escapes into the larynx and trachea from where it ends up into the lungs. This happens when the epiglottis is for some reason partially or completely open while we swallow food, resulting in food particles going down the airways. There is also a second form of aspiration which occurs when gastric juices with still undigested food particles escape from the stomach via acid reflux disease into the throat and then go down the wrong pipe into the airways. For the most part, only relatively small particles of food manage to escape into the lungs and do not usually obstruct breathing completely. Very often, inhaling food particles triggers the coughing reflex which expels them back out. But when they do stay in the lungs, complications may occur, either over the course of days or weeks or years. 1) Eating too fast. This can happen to anyone. You are eating fast because you’re rushing to get things done, aren’t chewing your food properly and struggling to swallow food and catch your breath at the same time. This is the most likely scenario that leads to food aspiration in the lungs. 2) Taking big bites of food. Too much food in the mouth at once makes it difficult to chew it all properly and increases the chances of aspiration when swallowing. 3) Talking while eating. Talking and eating at the same time is distracting and can cause a person to fail to properly alternate breathing and swallowing food. This can easily result in food going down the wrong pipe. The more engaging a discussion, the higher the risk of food aspiration. 4) Being distracted while eating. Reading, watching television, playing video games or performing other more challenging activities that demand both attention and good eye-hand coordination can cause you to accidentally breath in food particles. Food aspiration in toddlers and children is commonly the result of lack of attention, of being distracted while eating. Often times children play, laugh and are overall quite active when they eat and it only takes a moment for some food to go down the wrong pipe. 5) Dysphagia represents difficulty swallowing food, liquids, saliva or mucus. It can be caused by a number of medical conditions, from the flu or strep throat to physical abnormalities of the digestive or respiratory tract, nerve or muscle damage due to disease (stroke, multiple sclerosis, ALS, cerebral palsy, Alzheimer’s, Parkinson’s etc. ), injury or obstructive tumor masses. Having dysphagia often increases the chances of food aspiration. 6) Surgical interventions and anesthesia. Throat surgery, larynx surgery and other head and neck surgical interventions as well as having anesthesia can cause food aspiration. 7) Gastroesophageal reflux disease. Severe acid reflux can cause stomach juices with still undigested food particles to work their way up into the throat, from there they can accidentally go down into the larynx and cause food and fluid aspiration. 8) Being too young or too old. Food aspiration in the elderly is more likely because of diminished reflexes. With age and disease, muscle and nerves are affected which decreases protective reflexes such as coughing and swallowing. This increases the chances of food aspiration into the lungs. Food aspiration in babies and young children can be caused caused by underdeveloped protective reflexes or immature respiratory and digestive systems (for example, the epiglottis that closes the wind pipe when swallowing food may be underdeveloped and allow food particles to pass into the lungs). 1) Panic and breathing difficulty. What happens when food goes down the wrong pipe is you feel your breathing obstructed and, as a result, start to panic, fearing you can’t breathe at all and risk suffocation. This brings about further distress which increases your need for oxygen and accentuates the breathing difficulties. 2) Coughing is a protective mechanism that occurs automatically the instant food goes down the wrong pipe. It’s meant to help expel food from the larynx or trachea. Coughing is the life-saving reflex that also helps expel fluids gone down the wrong pipe in water aspiration. Food aspiration: what to do? The first immediate reaction should concern preventing suffocation. 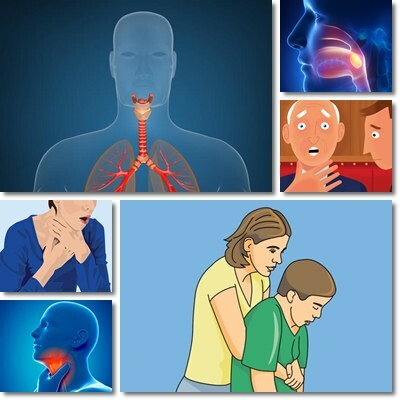 If there are signs of asphyxia and the person affected cannot breathe, attempts should be made to perform the Heimlich maneuver in order to dislodge the food obstructing breathing. The maneuver should continue up until medical help arrives. Below is a video explaining in detail how to perform the Heimlich maneuver on differently built people to help in case of food aspiration. What happens if you get food in your lungs? 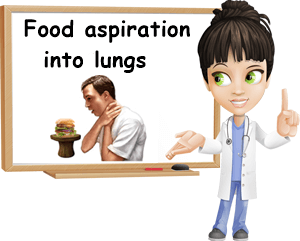 Food aspiration pneumonia is the most likely complication of aspiration of food into the lungs. It is caused by food particles in the lungs becoming infected and producing inflammation and the disease known as pneumonia. This is because food is not antiseptic and carries microorganisms with the potential to produce infection. Signs of pneumonia include fever, difficulty breathing, chest pain, coughing with or without mucus, changes in mucus color, hoarseness, wheezing, voice changes, difficulty swallowing, arrhythmia, tiredness, confusion etc. If you experience any of these symptoms, seek medical attention as soon as possible. Conclusion: Treatment for food aspiration consists in performing the Heimlich maneuver in case breathing is completely obstructed. Normal coughing mechanisms should be allowed to continue and encouraged because they help expel blocked food. Once the obstruction is removed from the airways either as a result of coughing or of the Heimlich maneuver, it could help to have the person take small sips of water to calm down, but not while they are still coughing to prevent water aspiration. Food aspiration represents a medical emergency and requires mobilization for immediate action from both those observing the incident and medical professionals. My son was diagnosed with lung aspiration. We believe it derived from a gamma knife radiation treatment. A swallowing test was done and it showed 100% aspiration. He now has a feeding tube in his stomach. He has multiple sclerosis for some 22 years. He is 42 years old. Any information on how to treat this, outside of what he’s doing now, would be appreciated. I am a born again Christian and so is he. We know God can heal him, if it’s God’s will to do so, but until that happens, we need to survive the stress and frustration. Hello, Ann. Food and water aspiration into lungs is an unfortunate side effect of degenerative neuromuscular diseases of the likes of multiple sclerosis. It’s essentially caused by problems to the muscles of the mouth and throat and the nerves regulating their activity. The feeding tube is to prevent food, water, saliva, gastric juices and really any solids or liquids from being accidentally aspirated into the lungs and causing complications (such as an aspiration pneumonia). Considering your son already has the feeding tube in, there’s really nothing else to do to prevent food aspiration at this point because the tube is taking care of the issue. Once the tube is removed, talk to your son’s doctors and learn what their recommendations are. Only they can tell you what the best course of action is because they are the most qualified to recommend a treatment plan or solution tailored specifically to your son’s condition and individual medical requirements. Like a personalized approach. I wish there was more I could do to help you. But I do believe your faith is a blessing and I am confident it will keep you going through the hard times and give you courage and strength to overcome whatever life brings. Wishing you and your son lots of health, Ann!